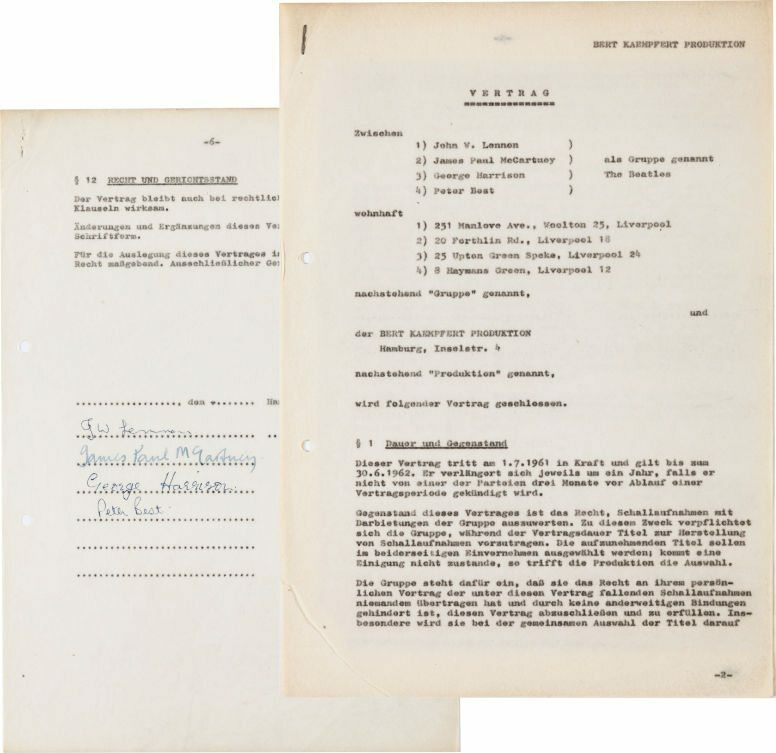 The first recording contract ever signed by The Beatles, which put the Fab Four on a path that would change music history, is expected to sell for $150,000 as Heritage Auctions presents The Uwe Blaschke Beatles Collection Sept. 19 in New York. The resulting single from the recording session — a rock & roll version of “My Bonnie Lies Over The Ocean” — led directly to the Beatles being discovered by manager Brian Epstein, through whose efforts the group then secured their unprecedented worldwide success. Blaschke’s collection tells the Beatles’ story through original photographs, documents, autographs and memorabilia. A noted Beatle expert and historian, Blaschke amassed one of the finest collections of Beatles material in Europe, if not the world, much of which was displayed at a dedicated Beatles museum in Hamburg, Germany. The 300+ lot collection covers the entire career of the group, but is especially notable for the inclusion of many items related to the time the Beatles spent in Hamburg from 1960-62, performing in the city’s vibrant nightclubs and honing their distinctive sound which would soon win the world over. “This is perhaps the most historically important Beatles document to ever appear at auction,” said Dean Harmeyer, Consignment Director at Heritage Auctions. “Without this contract, which directly led to their involvement with Brian Epstein, the Beatles may have never been able achieve their later success as a recording group. And at the time it was a momentous career milestone — they’d finally secured an actual recording deal, something they had only dreamed of before ‘My Bonnie'”.